← I Found God’s WILL! As of late, I get frustrated with myself because of my emotional state. You can ask my friends, I have never been like this in my life. I am simply unpredictable. I can be in the middle of having fun and enjoying my time with friends, when suddenly it hits… the tears begin to well up in the corners of my eyes, the look on my face changes, my physical appearance becomes rigid and scared… and then you know, somethings wrong. Sometimes it is really bad… I think I broke out in tears four times throughout one day. Well, for the longest time, I laughed at, scoffed at, and was extremely annoyed by those girls. Yes, that’s right, my own female race. My roommate and I in college would tell horror stories of girls crying and eating tubes of cookie dough… ah, the horror! Chick flicks… ewe! I prided myself in the tearless ducts of my eyes. “I haven’t ever cried during a movie,” I would boast. I don’t let my emotions rule me. I’m strong. I’m recklessly unafraid of anything… I am not your normal girl. A girl devoid of all of the emotional mess that messes so many things up. A girl who doesn’t get caught up in her emotions or blaming a certain time of the month on her woes. Well, I have to admit. I have found; I was the one with the problem. You see, the problem wasn’t actually my lack of crying. There is not a specific number of times a girl or guy should or shouldn’t cry, but my problem was much deeper than that. I grew up as the youngest in the family… a (now) pleasant surprise. When I was born my youngest sister was already 12 while my other two sisters were 16 and 20. Having another baby was not in my parents future plans. As a matter of a fact, my Dad didn’t speak for three days after they found out that I was on my way, but my life began to give my family a new reason to be. From a very young age I wanted to be like my older sisters. I wanted to be a big girl. They didn’t have to work hard to teach me to walk or use the potty, I just started wanting it on my own because of my desire to be like my sisters. I cried a lot when I was younger. My sisters use to tease me when I would get hurt and say “oh, do we have to call 911?” So, I wasn’t born a rock… it was something that came a little later. It as probably in Junior High. My middle sister and her son moved back in with us and I remember hearing fighting, arguing, and loud discussions about money a lot. I hated it. But I took it all in. It was about this time that tension in my family continued to escalate. My parent’s jobs were never going right, my Dad’s health was never where it should be, my sister was having troubles, and no one was able to get along. (Now, don’t get me wrong. I know my family loved me, and still does love me, but everyone was having issues of there own.) It was around this time I decided to handle my own issues and help others, but just deal with it all intrinsically. There were times I would cry in my car. There times I would let it all out talking to my youth pastor, but besides that… I was becoming a rock. You have a problem- yell at me, tell me all the mean things that have happened to you, tell me all your problems, tell me all your woes, tell me how unfair life is. I will listen. I will pray for you. I will become hard and strong and it won’t hurt me. Specifically there was a very rock forming time my Senior year in High School. My Dad had gotten very sick due to a lack of potassium which caused temporary paralysis. My Mom was doing my Dad’s job as a mail contractor and taking care of my Dad at the hospital an hour away, my sister was in jail, and her 6 month old baby was now in my care as long as my mom was busy. I remember being woken up at 3 in the morning giving my beautiful nephew a bottle as he screamed his head off in my ear. I changed him, I burped him, and yet he just kept crying. I remember turning up my worship music over his screams and just singing and praying him back to sleep. I missed a combined total of 6 weeks of school my Senior year. You couldn’t tell through my grades, because I was able to stay on top of my school work and scholarship applications, but my teachers all required written explanation of my absences. I remember using satire in writing to my Government teacher as I talked about the difference between need and want and my dilemma of family life verses academic life; needless to say, they accepted my reasoning and allowed me to graduate High School. I then flew with desire to my dream college at Indiana Wesleyan University. … where I continued in rock formation. I gritted my teeth and I was determined to never show a broken side. I would make it. I would be strong. I promised that I would not cry my freshman year… and I succeeded. Being a rock was just who I was now. I wasn’t necessarily harsh to people, but I definitely wasn’t always sympathetic. Like I said, I prided myself in my tear-less ducts. Senior year in college was a little more rough. I would say it was the beginning of the cracking. And of course it came through my heart for a boy. You’d think with all my rock tendencies that I would be well guarded from boys… but alas a weakness was found. Going hand in hand with the boy weakness was the sensitivity I had with that of the future I thought that God had for me. In March of 2010 my Dad went home to be with the Lord. During that immediate time. 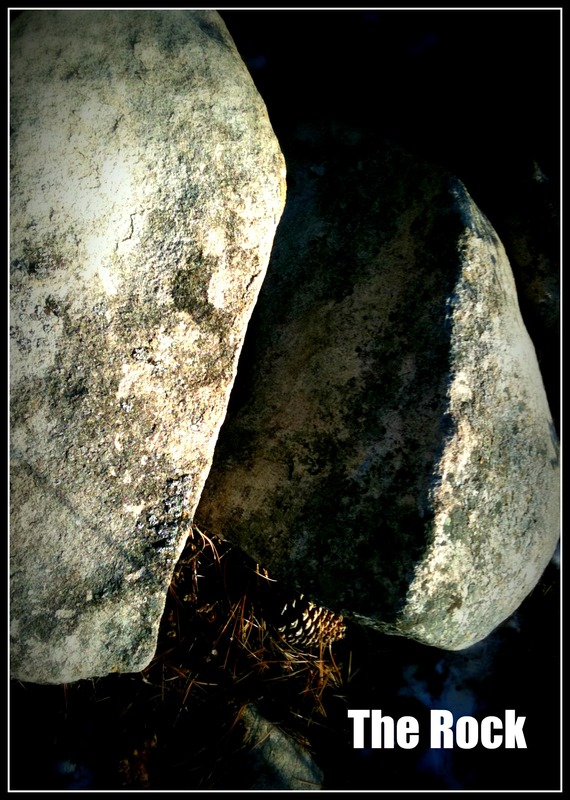 My rock surface was held tightly together. Some by a miracle strength and peace from the Lord, others by my stubborn rockness. During this time there was a definite pounding in my life taking place. It was painful. I miss my Dad so much. There is so much that we don’t realize we have until it’s gone (It makes me want to punch people who complain about spending time with their family). Through my love and heart for my friend and fiancee and now distant friend Ben… my rock surface has come smashing to the ground. I am no longer a rock. I am rather what mostly feels like a ball of uncontrollable emotions, but I have begun to see that… it’s good. My pride and strength has been smashed to smithereens. I know that being a rock was not what I was meant to be, but man, it was sure a lot easier. The fact that I am sitting her typing this with tears rolling down my face is proof. Well, I know what I need to do. Honestly though, I am not there yet. I know that instead of being the rock… I need to be on The Rock. I need to learn again what it means to be fully dependent on Him… my Lord, my Creator, the One we just celebrated Christmas for. I still have pieces of rock digging into my skin. I still have sensitive vulnerable skin that hadn’t seen the sun for years. It kind of feels like I just got a cast taken off my heart, and honestly, I’m scared! But there is absolutely nothing I can do, but cling on to this rock that is still somehow beneath my feet. I try all the time to figure things out, to put the pieces of rock back on my heart, but each time I do it ends in total failure. I can’t look to the future right now, I can’t plan my life, I can’t even hope, all I can do is cling to what I know and pray that the rock under me is better than the one I created over me. Oh, Lord, help me cling to You. Help me know You as my Rock and not try to be the rock any more. Help me please. Please help me learn to love again. This entry was posted in living, Uncategorized and tagged advice, broken, Counseling, emotions, future, girls, God, growing, healing, hope. Christianity, Jesus, pain, relationships, rock. Bookmark the permalink. I am really sorry for everything you had to pick up for me when you were so young… I love you and thank you. Hey Sis! NO APOLOGIZING! I love you and I wouldn’t have it any other way. I honestly loved my time doing the things I was able to do with Chance. The only thing I could ask is for you to continue to seek the Lord… there is no other way we will make it. I felt as if i was reading something I wrote, thank you for opening up and sharing this. It really touched my heart and voiced things I’ve been dealing with and had on my mind for a while but couldn’t quite articulate.